Technology is great when it empowers people’s lives, but it’s even better when it comes with a business opportunity. One such product is a fitness tracker brand that is selling like hot cakes everywhere. Would you be interested if I say that you can make money with Fitbit online? Just follow through these steps and see what I mean. Fitbit is founded in 2007 by Eric and James, two tech entrepreneurs who are passionate about using technology to help people live a healthier and more active lifestyle. The range of their fitness tracker functions includes calorie counting, sleep tracking and even GPS tracking. Due to popular demand, you can find them at various local retailers as well as eCommerce sites. Opening a retail store is a tedious process that requires a hefty investment, so this is not the route that I would recommend for beginners like you. Instead, I would encourage you to join their affiliate programs and earn sales commissions from every customer you refer to their site. For example, if you are an affiliate through ShareASale and you are recommending the Fitbit Surge, you would make approximately $30 from one online transaction. Sell 10 and you’d be making $300 from just one product review! 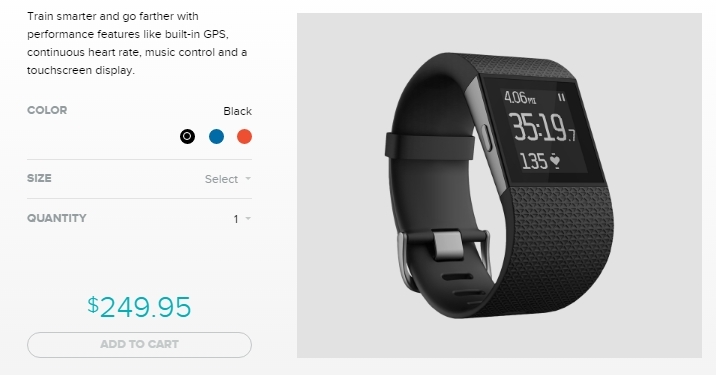 (Hint – There are currently 8 types of Fitbit fitness tracker, minus the accessories, services and apparel (that’s A LOT of opportunities if you asked me). Firstly, you need to identify who your targeted audience is. In other words, who is going to benefit from the product that you recommend. During this process, try to think outside of the box. The health and fitness community is a huge niche that spans over different age groups, so don’t restrict your audience to just marathon runners (I bet that is on the top of your mind). Individuals who are in weight loss programs, retirees who are seeking for a more active lifestyle, people who work indoors most of the time and patients with medical conditions; these groups are also part of the health and fitness community AND they can benefit from using Fitbit too. Once you have identified an audience, you can now proceed to build a website. But before that, you’ll need to decide on a domain name and a publishing platform. When it comes to publishing a website, I am a big fan of WordPress. They are easy to work with, there are plenty of professional themes, and they simply rank better on the search engines as compared to simple website builders. At SiteRubix, you can register a domain at a reasonable fee and connect it to a powerful hosting service that will launch a WordPress website within minutes. To learn more about their features, please read my personal review here. Now that your site is all set up, the next thing you need is traffic. In order to get good quality traffic – meaning people who are interested in buying Fitbit – you need to provide helpful content. The information has to offer value for that particular niche and to get to that, you’ll need to do some keyword research. The terms that people type into the search engines are all potential keywords. The more elaborated the terms, the more targeted audience you’ll be able to attract to your site. Here are some keyphrases that I’ve brainstormed using Jaaxy Keyword Tool. Following these topics, you’ll also need to write good product reviews for the fitness trackers that you intend to recommend. All the other content should eventually point to these product reviews which will contain affiliate links that you can monetize from. In essence, the more content you publish, the more traffic you would send to your reviews and hence, make more sales commissions. So, Is Fitbit Worthy of Your Time? As far as technology is concerned, the product is generally outstanding. However, that’s not the only reason why you should be promoting Fitbit. Here are other advantages to consider when you are applying for their affiliate programs. Fitbit is an innovative company and a leader in fitness tracker technology. I believe we can anticipate more good quality products to be launched in the future as more people embrace healthy lifestyles. This means that the product is capable of penetrating different niche markets too. The official website offers plenty of resources, one of which is the online forum that discuss every thing about Fitbit. As an affiliate marketer, you can use this platform to understand the products better from the consumer’s perspective. Whether it is the official site or on Amazon, the eCommerce and checkout interface is easy to navigate. This provides a good shopping experience for the customers as well. And if none of the above is convincing enough, I think the graph below should sum up the potential of Fitbit in the online market. This is clearly a very popular, upward trend for this brand so the opportunity is abundant if you are interested to make money online with Fitbit. Hey, I hope you have found some exciting ideas from this article. If you want to learn more about starting an affiliate business, do check out the tools and training at Wealthy Affiliate for more information. Have any thoughts or questions about this topic? Just leave them in the comment space below and I’ll respond as soon as I can. Hi Kristof, in order to answer that question, I think you might need to experiment as a customer, buying from Fitbit online store, to know the level of their customer service and shipping details. Amazon has a good reputation for their delivery so that’s probably where we need to make the comparison. I have been looking lately for some new products to expand my niche that could sell well, and Fitbit seems to fit the category. Thanks for the interesting and useful review! You wrote about selling the Fitbit through Amazon and ShareASale Network. Do you recommend using both or should we pick one? Which one would be better from your experience? I have a Fitbit that I seldom use nowadays. I used to wear it every day when I was still in a 9-5 desk job. But now I am more active and don’t need to trace my steps anymore. I have researched a lot about Fitbit before purchasing the model I decided to get. I can maybe make use of the knowledge, start a website and apply for affiliate programs. Thanks for the suggestion. It’s a familiar niche for me, so writing should not be a problem. It’s the technical side like SEO that might be challenging to learn. Hey Pitin, I am glad to know that this article has inspired you with a new business idea. As for SEO, they aren’t really that difficult. If you are using WordPress, there’s a plugin called All-In-One-SEO that will do half the job for you. The rest is just about placing keywords in the right place, getting engagement and publishing content regularly to get ranked on Google. According to the response I get at Fitbit community, you can use the GPS freely where there are satellite connections. Read this thread for more details. Hope this helps. Great guide on how to get started making money online Cathy. I’m looking into affiliate marketing and I imagine building a website would be a matter of just following a step by step process, but how do you decide on what content to write? Is it a matter of just writing about the things that you are interested in yourself? Hi Diego, you can write a variety of topics, whether they are of interest to you or to your targeted readers. The main point is to keep it as relevant as possible to your niche and the affiliate products that you want to promote. For instance, in the Fitbit niche, you can talk about food intake, sleeping routine and even outdoor activities, but it would be irrelevant to write about playing board games for example. I guess the more you understand the problems/concerns that your readers are facing, the better you’ll be able to mix and match different topics and then craft a content that suits them. Your article hits home with me. I enjoy fitness and a legitimate business opportunity. The options that you’ve outlined are great, and the structured process is very valuable. Becoming an affiliate, like you said, removes the burden of inventory and so much more. Thank you for the detailed information.